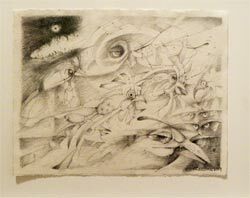 Lee Bontecou, whose work was most recently seen in New York City at a retrospective at sadly now departed MoMA/Queens in 2004 and at MoMA proper in 2010, now has a small gem of a show at Friedman Art just off Madison Avenue at 73d Street in the Upper East Side, for the moment at least a locus of innovation and inspiration among the endless boutiques thereabouts which now seem mostly trapped in 1920s retro. The show will be there until February 11th. 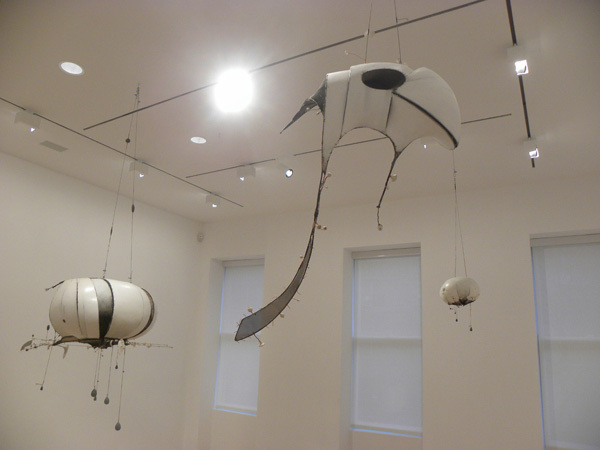 The most noticeable items on entering the gallery space are the sailing/space ships suspended from the ceiling. These are a further development of the work seen at MoMA in 2010 and are at some distance from the imposing dark vortices and black holes of her early work. (But the spirit of these has not entirely disappeared; see below.) The ships are made of 'welded steel, epoxy, wire mesh, canvas, porcelain, and paint'; the canvas appears to be weathered rather than new. In one ship there is a small metallic object that may be thought of as the engine. Although these sculptures are pretty rigid, they might be considered mobiles; a breath or a breeze gives them a little motion, and conveys the idea they are sailing through the air, or outer space. Besides these ships -- there are four of them -- there are a couple of sandboxes or 'sand pits' which rhyme with the oceanic theme. These are about the same size as your standard-issue suburban yard sandbox, and contain a considerable variety of objects stuck in sand-looking stuff, some of them apparently found objects, others constructed from wire or sticks, yet others created ceramically. My favorites among these were some round egg-like objects with mouths and teeth, reminding me of a Francis Bacon but a bit less threatening. I wish the objects had had more space around them, but real estate is always a problem in the big city. The drawings are rather different from the sailing spaceships and the sandboxes, and from each other as well. They fall into three distinct classes: black or color on white; textural abstracts; and black, graphite or color on black. A general theme, which does resonate with the sandboxes and the 'ships', are persistent partial images of sea creatures, especially sharp-toothed fish and birds. The spiral or circular organization of the drawings, on the other hand, is highly reminiscent of the aforesaid dark vortices of the much earlier, heavier work. One could see them as syntheses of the two genres. I liked especially the silvery-black-on-matte-black of some of these. These have to be seen in the glistening graphitic flesh; conveying their black-yet-silvery sheen through the cybernetic mill seems as yet to be beyond the powers of Photoshop and your favorite browser. There are also a few drawings in which the apparently depicted objects are less wound into spirals, and are more stretched-out and tree-like; these look like plans for future air-going mobiles.